Looking forward to getting my signed copy. Best of luck climbing the best sellers chart. 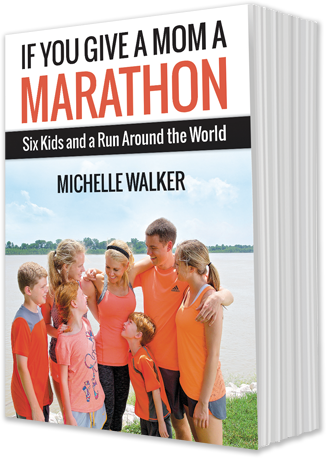 Author Michelle Walker takes us through her journeys as both a runner and mother of six. Her glimpses of how she succeeded in both, inspire people not to give up on their dreams. Well written and entertaining, this book is one that every person will enjoy. In “If you Give a Mom a Marathon,” Michelle Walker takes us on her journey of self-reinvention from corporate accountant to Ironman. We get to know a charming yet vulnerable person who candidly accounts the times she worked hard and failed, to make us appreciate – and root for – her ultimate successes. In detailing her aims, Michelle provides powerful insight into the analysis, strategy, determination and hard work required to set and achieve big goals. As she ups the ante, we feel the tension. Yet, this is not a recipe book – you’ll not find lists of workouts, number of reps and miles, or cross-training advice. Instead, she shares her inner voice — fears, hopes for her children, faith, and dedication to family – while setting and recalibrating ever-increasing goals and benchmarks. Michelle’s book is a window into the mind of a champion.